Dominican Sister Mary Xavier Winterrowd, a former member of St. Christopher Parish in Indianapolis, professed the simple vows of poverty, chastity and obedience as a Dominican Sister of Saint Cecilia Congregation in Nashville, Tenn., on July 28. 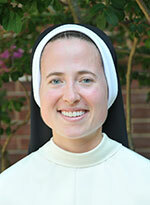 Sister Mary Xavier is the daughter of Joe and Debbie Winterrowd. She is a graduate of Ben Davis High School in Indianapolis and graduated from Ball State University in Muncie, Ind., where she earned a bachelor’s degree in the science of child development.